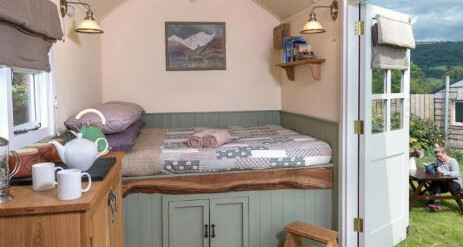 Cui Shepherds Hut for glamping is up a quiet lane close to the bustling village of Talybont-on-Usk in Wales. The village has a coffee shop, four pubs, a shop and post office. Close by is Brecon, a beautiful cathedral town with views of the majestic mountains all around. 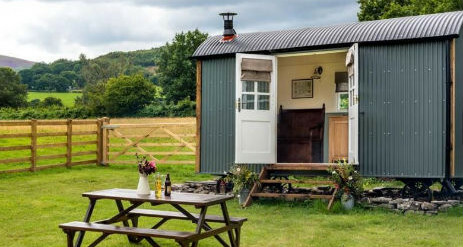 Here you can truly immerse yourself in country life. 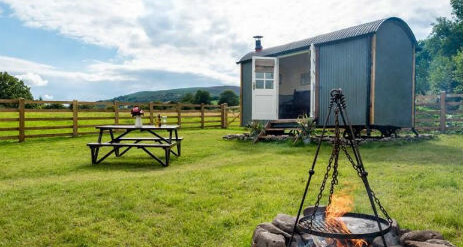 This is a wonderful glamping experience located on a pony stud farm in the foothills of the Brecon Beacons where horses graze in the neighbouring field. 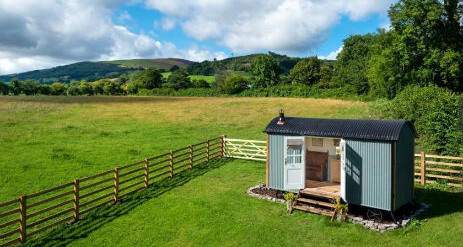 Enjoy the views over the farm and over the Usk Valley to The Allt and the Black Mountains. It’s a pretty, romantic and relaxing spot and great for cycling and walking. 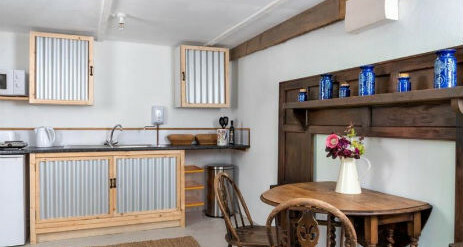 A few metres away is a kitchen, dining area and luxury shower room. 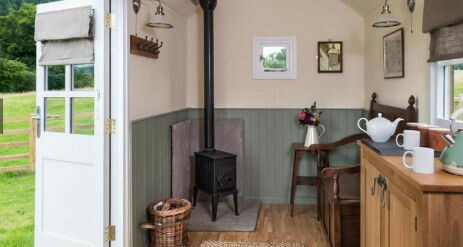 The kitchen is equipped with a sink, fridge, microwave and electric hob, large dining table and chairs and plenty of useful information and maps about the area. Outside, in your own private field, is a fire pit with chairs and a table, perfect for wiling away a summer’s evening. 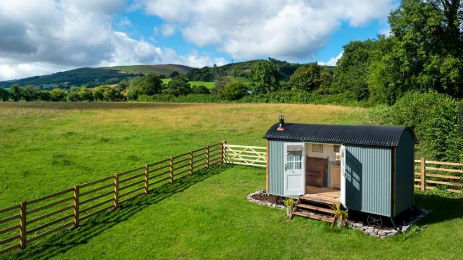 Brecon is 7 miles away, Crickhowell 9 miles away and Hay-on-Wye 11 miles away. From the door, you can walk the famous Taff Trail, or any number of footpaths leading up to the Beacons. Hire a kayak and paddle along the canal, or hire a mountain bike in the village and ride some of the fantastic mountain bike trails or testing road bike routes.